The Atlantis brand completes its line with an impressively liveable boat under ten meters. It features two Volvo Penta D3 engines with Duoprop sterndrive enabling it to reach speeds of up to 32 knots. 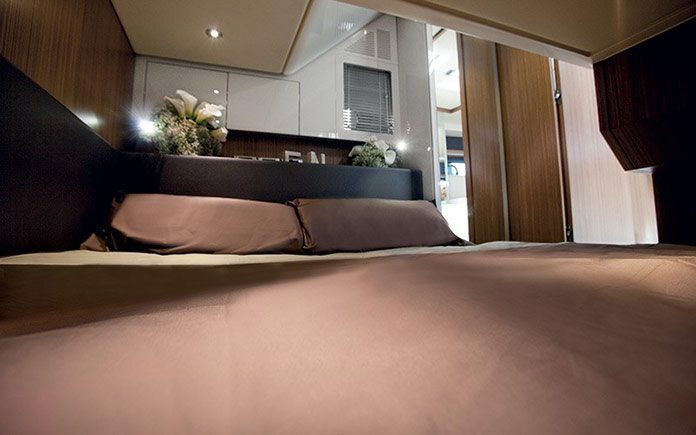 There are four beds with a double cabin amidships and a convertible dinette. 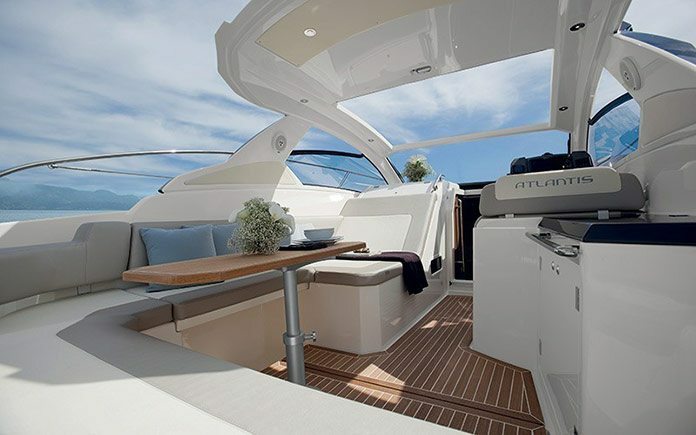 Azimut Atlantis 34 it’s a completely new design, an aggressive response by Neo Design and the Atlantis Design Department incorporating the distinctive style and features of the larger models while entrusting the engineering to Seaway. Presenting a new model with a hull length of less than ten meters also signifies that Atlantis intends to resume its place in the medium/small sector. Atlantis 34 is the result of an impressive prerequisite, challenging to achieve: being contemporaneously a great open and a great cruiser. This means intensive effort was put into maximizing the open spaces as well as the interior areas, where you’ll find a master cabin separated from the rest of the interior in addition to a pleasant open space in the bow that is both convertible and well-lit thanks to the hull’s large windows. The exterior line echoes that of the larger models, which began with the collaboration between Atlantis and Neo Design and has produced a range of 5 new models – from 34’ to 58’ – completely updated in only two years. Boats that are unmistakable with a free board, which takes up 60% of the total elevation, this means a muscular hull that houses extremely comfortable interiors spaces and a deckhouse that fills the remaining 40% of the visible area. The exterior sports a swim platform functioning as a 2.5 square metre private beach that can also hold a tender (up to 2.5 m). The table for six in the living area can be transformed into a sun pad and the sunroof is equipped with a manual soft-top, standard for this series. Next to the helmsman’s station is a comfortable chaise-longue, a convivial spot that will become the centre of on-board life. Two symmetrical, 21 cm wide walkways lead with ease and safety to the bow, where you’ll find a spacious sun pad. The deck is well equipped with storage, bottle holders and lockers. 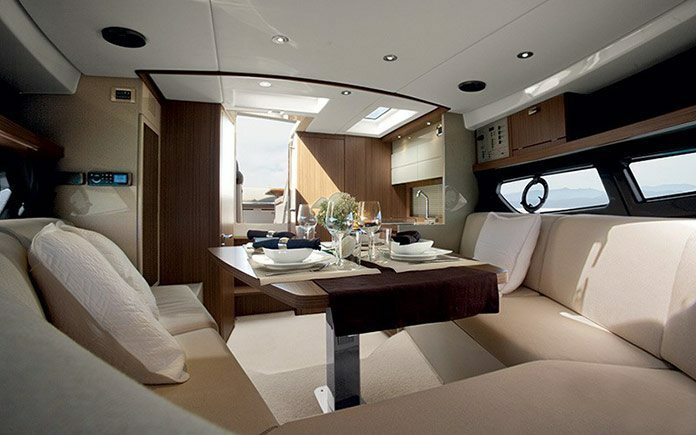 Below, the living area is dominated by a large, V-shaped sofa/dinette that converts into a double bed (200 x 250): a genuine dinette for lunch as needed, served by a well-equipped galley, 1.9 m high and featuring a double hob cooker and 80 litre refrigerator. The head features separate access and natural ventilation. 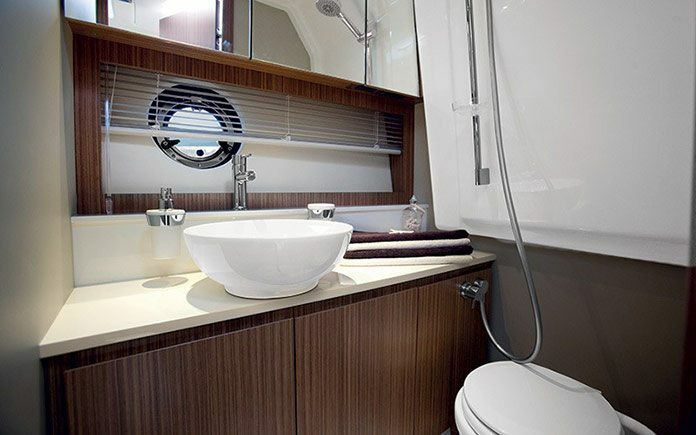 Aboard the Atlantis 34 you’ll find space for a comfortable master cabin, well-insulated from the rest of the interior, with maximum headroom of 1.95 m and considerably large bed (147×200 cm). The oak wood finishes with lacquered insets are same as those used in the fleet’s larger models. 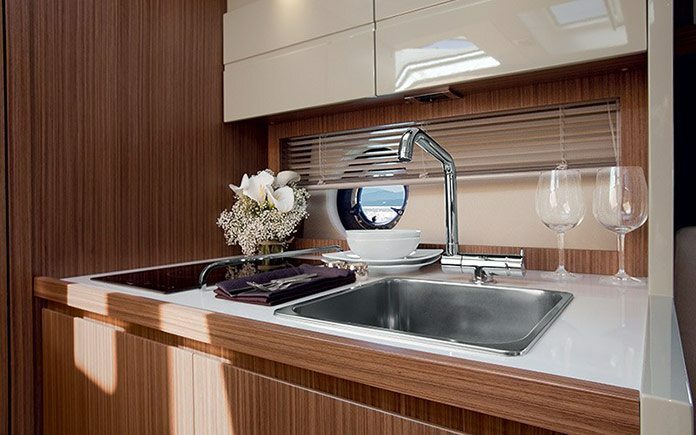 Lockers, cabinets and wardrobes offer a storage volume of more than 1,350 litres, distributed between the dinette/galley and the master cabin. Characteristics such as these make this boat a true cruiser, allowing two couples or a family to enjoy a pleasant cruise. Substance and comprehensiveness make the Atlantis 34, entry-level for this range, a particularly appealing and quite competitive boat for those looking for both quality and comfort combined with compact size. It features two Volvo Penta D3, 220 hp engines with Duoprop Aquamatic sterndrive, one of the most efficient and durable systems for powering boats of this size, and also an excellent choice due to its low maintenance requirements. 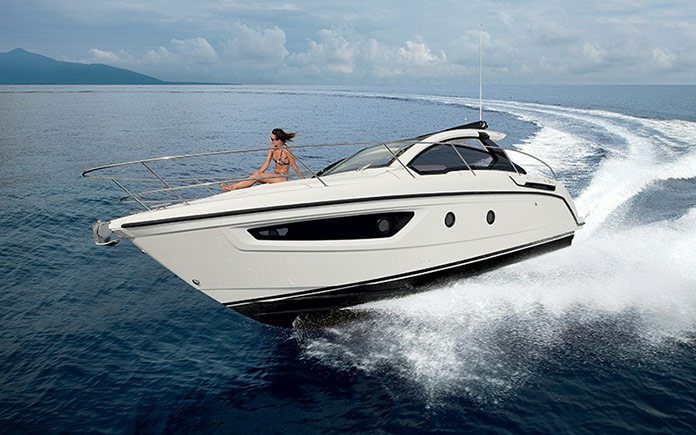 The performance offers a maximum speed of 32 knots and a cruising speed of 29 knots. 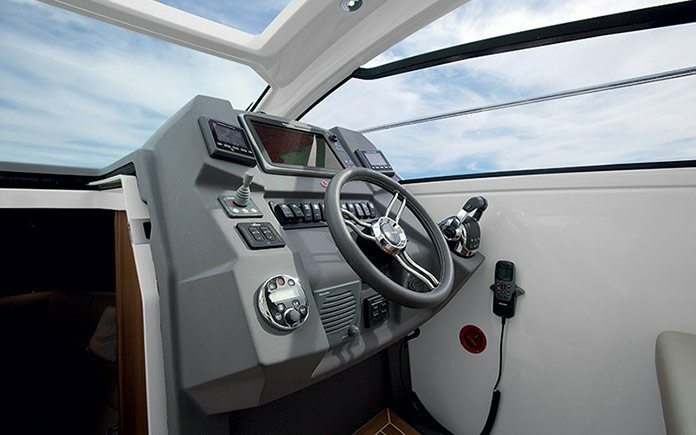 The helmsman’s station on deck is supported by the latest generation of Raymarine touch screen instrumentation with the ability to install GPS Radar up to series E125W, with Tridata instruments, Joystick and Fusion Hi-Fi control. The fuel tank capacity is 650 litres. This yacht is available for charter. Contact us. Cruising speed (at half load): T.B.D.